Philippine News - Everything that concerns a Pinoy life. 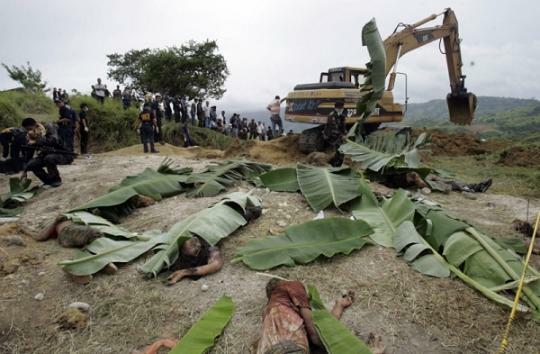 Hearing the news about the Maguindanao massacre last year is a big shock that crumpled Filipino hearts. With Andal Ampatuan Jr. together with his own father Andal Ampatuan Sr. as the main suspect with this heartless massacre. Now if you are like me who are wondering about the case's update, here are so far the things that I remember, in no accurate order. 1.) Before vice mayor Esmael Mangudadatu now won the governatorial seat at Maguindanao. 2.) Now governor Mangudadatu was reportedly attacked by a suspected Ampatuan clan's goons in Gaisano Grand Citimall Ilustre in Davao City. The attacker though ended up dead with the governors' bodyguards on guard, shooting him dead on the spot. 3.) Guns were earthened by authorities on Ampatuan's owned armory. Ampatuans' private armiesssss were disarmed, but some reports says that some of their private guard remains and still armed. 4.) 161 suspects were identified which said had took part on the massacre. 5.) A very important eye witness is currently on authorities hand. This witness is literally qualified to be called as an eye witness as he had witnessed the massacre using his bare eyes on spot. 6.) Though unpublicized, president Noynoy Aquino's support for the case's progress is felt by the entire country. Do you know any updates? Please do share it with us by commenting below. Is November 2, 2010 A Holiday? Special Holiday?